If you were ever lucky enough to see Hugh Jackman dancing and cha-cha'ing across the stage like the Energizer Bunny after one too many Redbulls in The Boy from Oz, you will know that the guy has raw talent. Not only can he sing and dance at the same time - yes Britney, it is possible - he captivates audiences world wide and remains grounded as a genuinely nice guy while doing so. But in his incredible ability to seemingly channel the essence of the famous Peter Allen on stage, he embodied him also, dancing away the pounds and revealing a long and lean figure. But it was his role as Wolverine in the X-Men franchise that got tongues wagging as he packed on pounds of solid muscle to reveal a big and buff torso without a love handle in sight. How did he do it? His trainers, Michael Ryan and Steve Ramsbottom, tell us how he went from Broadway star to ripped superhero. Variety is the spice of life and it seems that it is also the spice that Hugh took when it came to working out that got him in such great shape. His workout varied week in week out to ensure that there was maximum muscle confusion, leading to larger strength gains and fat loss. Things that were varied included the amount of weight lifted and the number of reps and sets performed, the tempo of the eccentric and concentric movement (the up or down, or the push or pull of the lift), and the amount of rest that Michael allowed him to have in between each set. Exercises were also super-setted ensuring that failure was achieved by at least the end of each exercise. 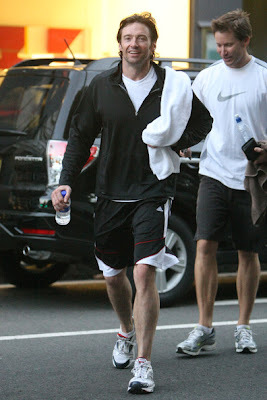 Hugh also worked with Steve Ramsbottom, a trainer and owner of Performance Institute of Burnaby B,C. who divided Hugh's workouts into two very distinct phases, each lasting 6 - 12 weeks, which focused on two very different goals. The first phase which incorporates a tempo of 3 seconds up, 1 second down, creates a muscle tension that is ideal for maximum muscle building... and it must work because Hugh piled on 15 pounds of muscle during his training with Steve. The second phase, Hugh simply lifted heavy weights with no real focus on tempo, which focuses more on building strength. Hugh would always start his workouts with at least 10 minutes of cardio as a warm up before he would attempt to lift any weights, and after he did he would follow that up a further 20 minutes of running or swimming as a cool down to finish his workout. 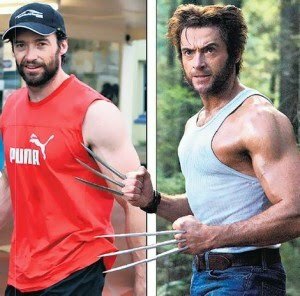 While working with Steve, Hugh would attend Bootcamp once a week every Friday further turning his body into a fat burning machine, and during the last week of each of his workout phases, Hugh would reduce his weight lifting to only once per week and increase his cardio by doing Yoga, Tai Chi and Pilates. Hugh's diet plan was incredibly strict and involved him eating whole, nutritious foods, high in protein 6 times a day. All processed and refined foods were out, including soda and other calorie laden beverages and were replaced with large amounts of water and peppermint tea. Because filming would often start early in the morning, Hugh would be up at 4am to devour his first meal consisting of egg whites, before heading off to workout. He would eat carbohydrates only in the morning and after midday would cease eating them completely, focusing his meals more on meat or fish with some vegetables. Before bed Hugh would eat cottage cheese, providing him with slow digesting casein protein, which is recommended at night to provide your muscles with a steady flow of slow absorbing protein while you sleep to ensure they remain in an anabolic state of muscle growth. I always recommend choosing whole foods sources of protein such as lean meat, fish and dairy over processed protein bars and shakes and this is the same approach Hugh took with his eating plan. Protein shakes were used, but restricted to before and after his workouts to ensure that his muscles were replenished quickly with fast absorbing protein and carbohydrates. I have to admit, I have featured a few male celebrity workout plans and diets on Healthy Boy, and Hugh's would have to be one of the most rigorous, and most average people (including myself who has copious amounts of time to blog, workout and watch every entertainment news channel chronicling the countdown till Lindsay gets thrown in the slammer), would not be able to follow this routine so strictly. Not to mention that Hugh also got massages every day to help reduce muscle soreness and speed recovery, I mean how amazing would that be? But as with any diet, fat loss, or training advice I post on my site, it's good to read the concepts, and just take one or two that you find interesting as see whether they work for you. Whether it is changing the tempo of the weight you lift like Hugh did, which I highly recommend, or avoid eating carbohydrates after midday, you don't need your own personal trainer or masseuse 24/7, to benefit from a Hollywood celebrity workout plan. that surname of the second trainer mentioned made me chuckle.